Nick Heidfeld was the dominant winner of the 1999 F3000 championship, driving for the junior McLaren team, West Competition. He earned a drive for Prost in F1 for 2000. Tragedy struck the season, with Heidfeld's only real rival Gonzalo Rodriguez killed in practice for a Champ Car race at Laguna Seca. After the season Jason Watt, who beat the late Rodriguez to second in the championship in the final race, was paralysed in a motorbike accident. Stephane Sarrazin, who also raced once in F1 for Minardi this year, was consistent in the Prost junior team, but unable to mount a serious challenge. Bruno Junqueira was fast all year, but prone to mistakes and bad luck. He earned the chance to fight for an F1 drive with Williams for 2000 nevertheless. 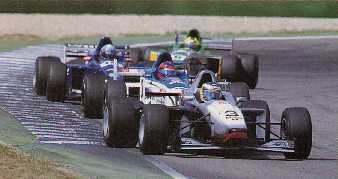 Teammate Max Wilson had a poor year, but tested for Minardi as a possible driver for 2000. Nicolas Minassian made up for his poor '98 rookie year with McLaren by winning with the new Kid Jensen Racing squad at Silverstone. Key: R=retired, ns=did not start, NE=did not enter, dqx=disqualified from position x. Notes: The large number of entries meant qualifying was split into two sessions, for even and odd numbered cars. The fastest group had its fastest driver starting from pole, with the two groups lining up on different sides of the grid. *European Formula - team was European Edenbridge until after round 5, when European Formula bought out Edenbridge after the partnership dissolved. **WRT - team was entered as WRT Fina in rounds 1-4, but David Saelens' defection to Super Nova saw Rafanelli's F3000 squad lose their title sponsor. Max Wilson was bannned for 1 race after collision with Norberto Fontana at Hungaroring. Gonzalo Rodriguez was tragically killed in a CART accident at Laguna Seca before round 10. He was awarded third posthumously. In a tragic year, Jason Watt also suffered paralysing injuries in a post-season motorbike accident.